This chocolate pudding cake recipe is a rich chocolate cake that’s made with pantry staples and is ready from start to finish in less than an hour. It also happens to be low fat! 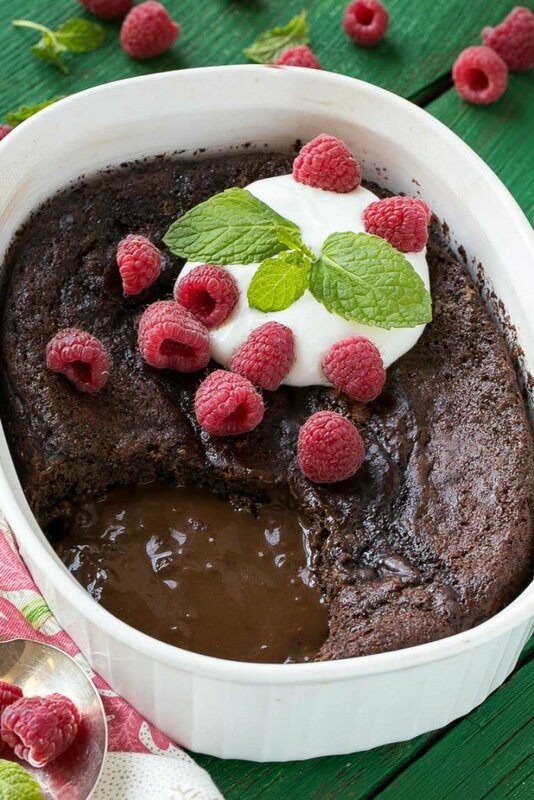 Chocolate pudding cake has a fudgy cake layer with molten chocolate pudding underneath. It takes just minutes to put together and is elegant enough to serve to company. I’ve mentioned a couple of times that I used to have a food blog a while back before I had kids. This chocolate pudding cake was the most popular recipe on my old blog, and it also happens to be low in fat! My mom found this easy chocolate pudding cake recipe in a magazine more than 20 years ago and we’ve been making it ever since. I still have the original page of the magazine, the advertisement next to the recipe is for a brand new product called mini M&M’s, that’s how old it is! The reason we’ve been making this recipe for so long is because it’s unique, super easy to make and the ingredients are so basic that I always have them in the house. 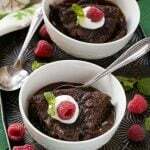 How do you make chocolate pudding cake? This recipe starts off with a basic cocoa-based cake batter. The magic happens when a mixture of cocoa powder and brown sugar is sprinkled over the top and then boiling water is poured over the whole thing. It looks like a terrible mess going into the oven but what comes out is a chocolate lover’s delight. 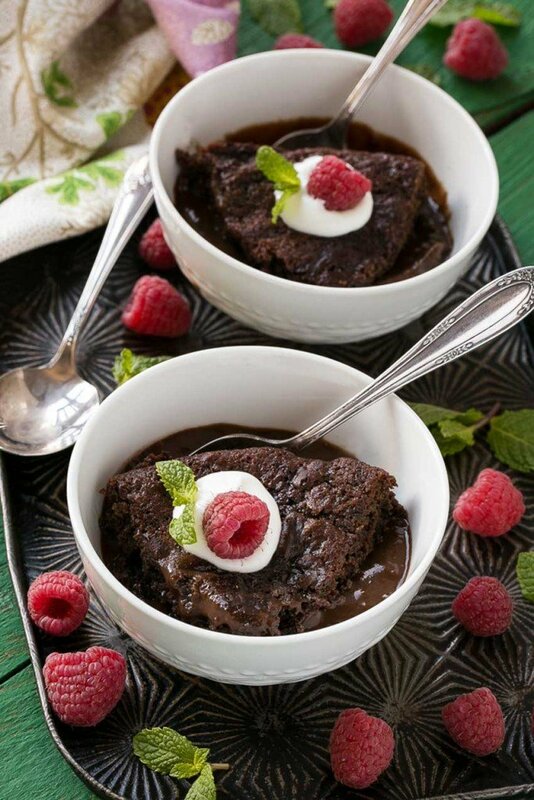 A rich moist cake forms the top layer and a chocolate pudding sauce forms on the bottom. It’s great served warm or cold and it only has three tablespoons of butter in the entire recipe so it’s not going to break your calorie budget for the day. 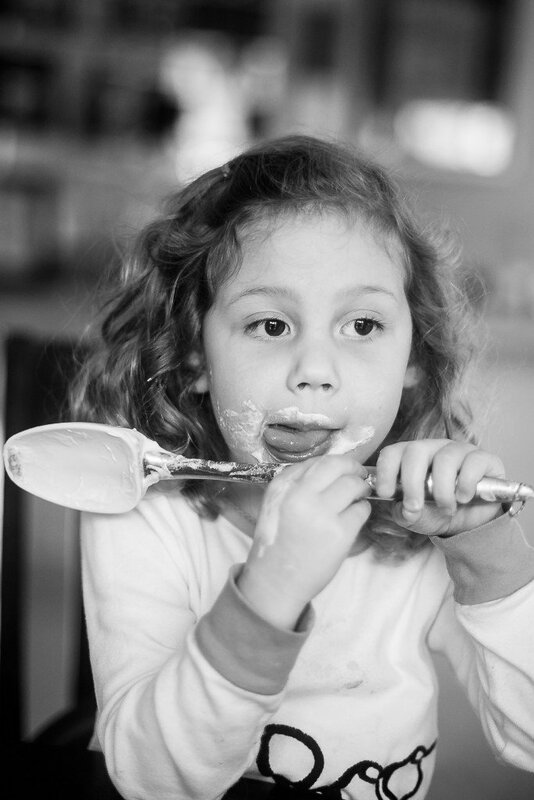 The cake batter also happens to be egg-free, which means you can let your helpers lick the spoon! 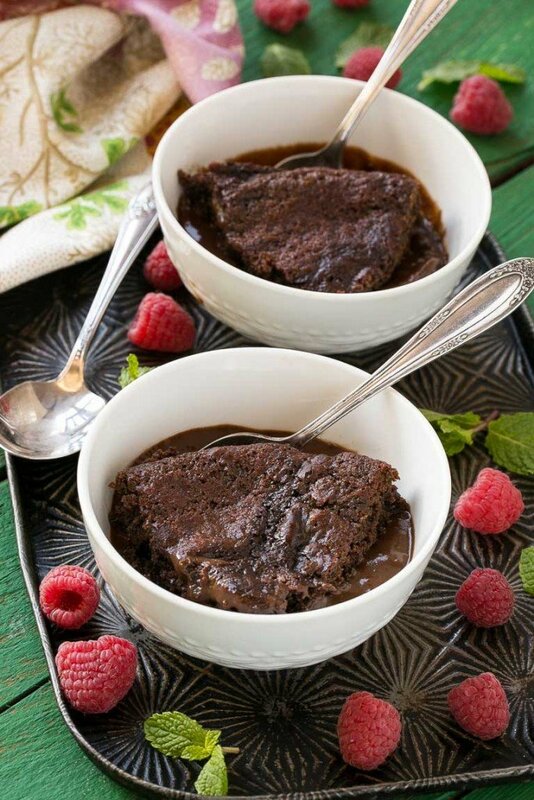 This easy chocolate pudding cake is great for a quick and casual dessert or you can dress it up by serving it with a scoop of vanilla ice cream or whipped cream and some fresh berries. Either way, I hope it becomes a tradition in your family like it has in mine. This easy chocolate pudding cake recipe is a rich chocolate cake that's made with pantry staples and is ready from start to finish in less than an hour. It also happens to be low fat! berries whipped cream and mint for garnish if desired. Preheat oven to 350 degrees F. Grease a 9 inch square baking dish or round souffle dish. Combine flour, granulated sugar, baking powder, baking soda, salt and 1/3 cup cocoa in medium bowl. Add milk, butter and vanilla, stir until just blended. Spoon the batter into the prepared dish. Combine brown sugar and remaining 1/4 cup cocoa in small bowl. Sprinkle evenly over batter. Pour boiling water over entire mixture; do not stir. Bake 35 to 38 minutes, until a toothpick inserted into the top layer comes out clean. Cool at least 10 minutes. Serve in bowls with garnishes if desired. Make Ahead: The cake can be made a day in advance and served chilled or at room temperature. Little Helpers: The kids can help make the cake batter and sprinkle the brown sugar/cocoa mixture over the top. I haven’t made the recipe yet but I’m wondering if I could use a double boiler to melt chocolate down instead of using cocoa powder. I don’t think that would work, this recipe relies on that layer of cocoa and brown sugar on top to create the pudding. I’d like to make this in a spring form pan but didn’t know if it’s gooey just in the center or all the way to the edges. If so could I just add less water so the edges are a little more solid? The entire bottom layer is gooey, I wouldn’t recommend using a springform pan for this recipe! Thanks for your quick reply! I’ll try something different. We love this recipe! It’s become a family favorite! The cool thing is you usually have all the ingredients in your home! I’ve even used frozen berries! I haven’t tried doubling it, although I don’t see why it wouldn’t work to do so! I’d use a 9×13 pan rather than 9×11. This looks so good! I want to make this for an upcoming Christmas potluck – is it possible to make in advance and then heat it up? Or would that make it less gooey? Hi Cato, I have never tried to reheat it before but I think it would work if you did it at a low oven temperature. It stays gooey even when cold though, so you could serve it cold or at room temperature and it would still be great. You should come link this up on my link party today! IT CAME OUT AMAZING!!!!!!!!!! LOOKS JUST LIKE THE PICTURE TOO! THANK YOU FOR SHARING, ILL BE MAKING ANOTHER ONE TODAY! Thanks so much for reporting back, I’m so happy you liked it! Don’t you just love pudding cake? It’s like the best dessert ever! this looks INSANELY good and even better now that you said it is low fat. How do you make the PRINT box for your recipes? Thanks Maria! 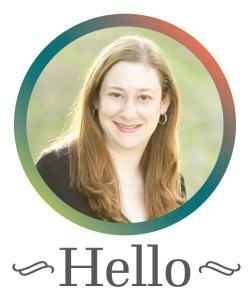 I use the Easy Recipe plugin for WordPress. 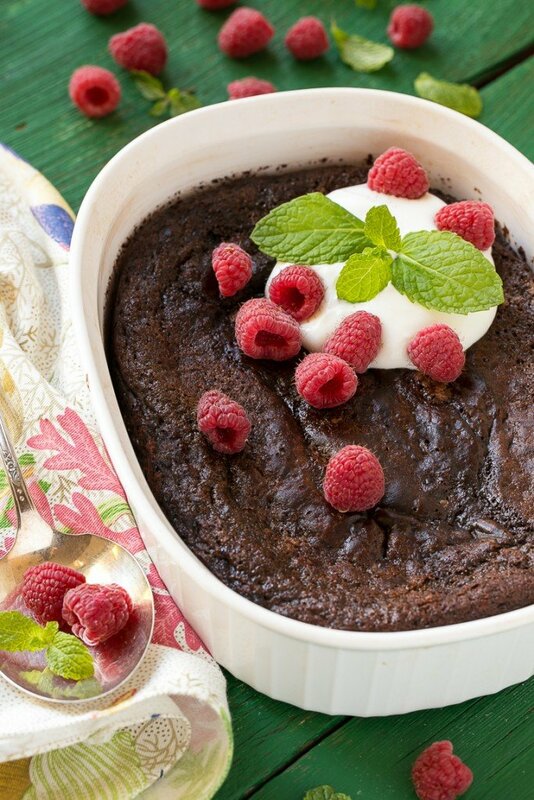 Oh my, your pictures and this post have me craving chocolate pudding cake! All that oozing chocolate is heavenly. Can’t wait to give this recipe a try! Ohhhhh my goodness. It looks decadent. I’m adding this to the “girls lunch in” list. They’re going to love it. This sounds so much like a chocolate pudding cake recipe I tried once! It is so magical how it transforms from powder to pudding. Love your post.